PA surprised over threats by the United States to shut down the PLO office in Washington unless it starts serious talks with Israel. The Palestinian Authority (PA) on Saturday night expressed its surprise over threats by the United States to shut down the Palestine Liberation Organization (PLO) office in Washington. On Friday, the Associated Press reported that the Trump administration had put the PLO on notice that it will shutter their office in Washington unless they entered serious peace talks with Israel. According to AP, Secretary of State Rex Tillerson has determined that the Palestinians ran afoul of a provision in a U.S. law that says the PLO mission must close if the Palestinians try to get the International Criminal Court to prosecute Israelis for crimes against Palestinians. A State Department official said that in September, PA chairman Mahmoud Abbas crossed that line by calling on the ICC to investigate and prosecute Israelis. The law now gives President Donald Trump 90 days to consider whether the Palestinians are in “direct and meaningful negotiations with Israel.” If Trump determines they are, the Palestinians can keep the office. An official told AP it was unclear whether the U.S. might close the office before the 90-day period expires, but said the mission remains open at least for now. Nabil Abu Rudeineh, a spokesman for Abbas, said on Saturday night the surprise stems from the fact that the meetings between Abbas and Trump were characterized by a full understanding of the steps necessary to create an atmosphere that would allow the resumption of the peace process. He said that the American threat represented an unprecedented step in the history of U.S.-Palestinian relations and could have dangerous implications for the peace process and the relations between the United States and Arab countries. He warned that taking such a step would undermine efforts to achieve peace and would reward Israel which, claimed Abu Rudeineh, is working to thwart U.S. peace efforts through its “settlement policy” and its opposition to the two-state principle. Meanwhile, Prime Minister Binyamin Netanyahu’s office would only say on Saturday night in response to the AP report, “This is a matter of U.S. law. We respect the decision and look forward to continuing to work with the U.S. to advance peace and security in the region." Reports of the threat to shut down the PLO mission in Washington came several days after the House Foreign Affairs Committee unanimously approved the Taylor Force Act. The bill, named for U.S. army veteran Taylor Force, who was murdered in a terrorist stabbing attack in Tel Aviv in March, 2016, would cut funding to the PA unless it stopped its payments to terrorists and their families. The bill will now move to the House floor to be voted into law. The PA was unfazed by the new law. 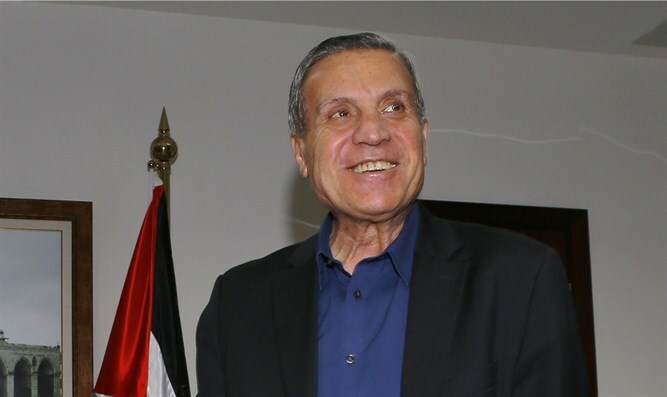 Abbas adviser Nabil Sha'ath made clear that the PA leadership would not give in to U.S. threats to stop its payments to terrorists and their families. "These are heroes and we are responsible for them and for their families," Sha'ath said, explaining the PA's approach to the security prisoners and their national commitment to them.